With each passing day, history is made somewhere by someone so it’s often interesting to look back on what your beloved football team has done on this day in history in years gone by. Read on to find out what happened when the Swans played on May 12th in previous years. 2 years ago on 12 May 2013 – The Swans lost 2-1 against Manchester United on the day that manager Sir Alex Ferguson took charge of his final game at Old Trafford. Despite the Swans giving a good account of themselves against the Premier League Champions, they only had a Michu goal to show for their efforts. United were presented with the Premier League trophy at the end of the game. 4 years ago on 12 May 2011 – An outstanding defensive performance from the 10-man Swans was enough to hold Nottingham Forest to a 0-0 draw at the City Ground in the Championship Play-Offs Semi-final 1st leg. The result was all the more surprising given that Swans fans favourite referee Mike Dean, had showed Neil Taylor a straight red card after just two minutes for a lunge on Lewis McGugan. 31 years ago on 12 May 1984 – Midfielder Phil Williams made his debut for the Swans as they were thrashed 5-nil by Portsmouth at Fratton Park in Canon League Divsion Two on the last day of the season. 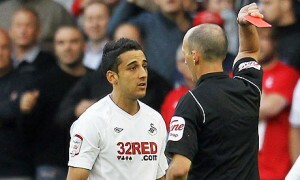 The defeat meant that the Swans had gone two whole seasons without recording an away win in the league!